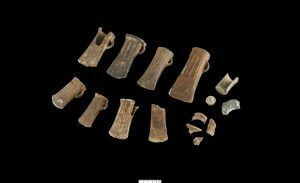 A pair of Bronze Age hoards discovered in a Monmouthshire field have recently been declared treasure. A number of bronze tools and weapons were discovered on the same day in January 2015 on farmland in the Llantilio Crossenny area. Both discoveries were made in different areas of the same field, while a group of metal-detector enthusiasts were searching the land. The items went on to be declared treasure by HM Coroner for Gwent last month, and it is hoped they may provide an insight into the lives of early residents of the area. One hoard contained nine bronze socketed axes, which have been dated to the Ewart Park phase of the Late Bronze Age,between 3,000 and 2,800 years ago. The second smaller collection was found 135 metres away from the first discovery, and includes two bronze socketed axes and a bronze spearhead, dating back to the same age. An archaeological investigation of the find-spot was carried out by museum archaeologists in October 2015 with the help of the finders. Findings at the site suggested that the two hoard groups had been buried in two separate pits in the ground, and they were located beside small stream channels. Abergavenny Museum is keen to acquire these prehistoric finds for its collections following their independent valuation, and It hopes to acquire the hoards with grant support provided by the Saving Treasures; Telling Stories funded by the Heritage Lottery Fund, which aims to ensure a range of treasure and non-treasure artefacts can be purchased by accredited local and national museums throughout Wales. 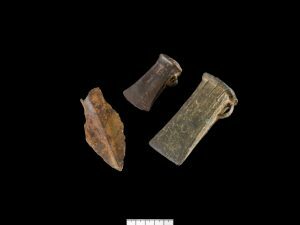 Rachael Rogers, Curator at Abergavenny Museum said: “We are really excited by these finds which contribute to the prehistoric story of the area. We look forward to them coming to Abergavenny Museum, so they can be cared for and enjoyed by our many visitors and users. The items will join other archaeological treasures from Wales and around the world at National Museum Cardiff in the Treasures: Adventures in Archaeology exhibition, which is on display until end of October.